For best results, replace the lamp in your Biozone Air Purifier annually to maintain the purifying power of the product. The lamp (bulb) in all Biozone Air Purifiers is effective for and should be replaced after about 9,000 hours or one year of continual use even if the lamp is still glowing after this period. If the lamp burns out in your Biozone Air Purifier, you must replace the fuse as well. We suggest ordering spare or replacement fuses with lamps, normally one fuse per lamp. 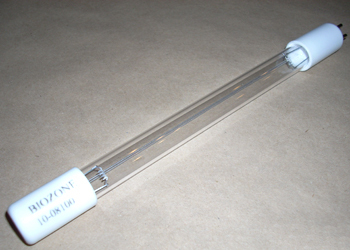 We offer only official Biozone lamps with the full manufacturer's warranty. Please note that use of non-Biozone lamps or parts or using the wrong bulbs voids the one-year warranty provided by the factory. Also, only official Biozone lamps are covered by Biozone's lamp warranty. No need to risk losing your warranty since we offer the most competitive pricing for all the lamps and fuses. If you have purchased your lamp from other vendors and your Biozone is not as effective as before, it is very likely that the cheaper lamp is a copy and is not the real lamp. Majority of Biozone Air Purifiers used in non commercial applications such as homes and offices have used two sizes for the lamps, 4" and 8" sizes. Recently however, Biozone has changed the two sizes to only the 8" size lamp with different UV production capacities from %10 to %100. Although the 4” bulb’s application has been phased out, this size replacement bulb is still available for the older Biozone air purifiers. 1.25 Amp 250V slo-blo fuses for all Biozone units except the Biozone 4000. If, for any reason, you are not completely satisfied with your purchase simply return the item within 90 days for a complete refund or exchange.